It's oh so gloomy here in Los Angeles today. After staying up all night to write an article, I'm feeling the need for a relaxing day off! So far, I've remained in pajamas and have been contemplating making a coffee run. I'm suddenly craving some sort of holiday flavored drink (other than eggnog, blec!). 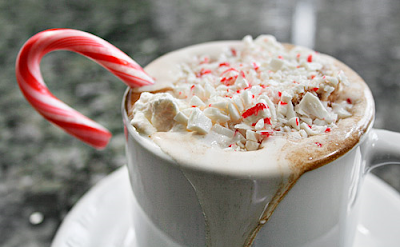 Here's a Paula Deen "Peppermint Chocolate Coffee" recipe to enjoy! I've been in my jammies all day watching football and it has been blissful. I totally endorse this (non)activity. As for holiday drinks, I had a peppermint mocha yesterday and it was so good! Looks AMAZING! I want a lazy day!